I’m hiding today, looking from my glass cube at Crayola colors on mountains to the northwest. 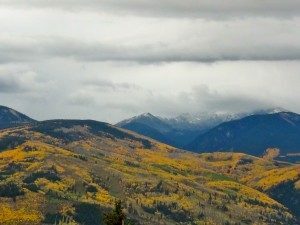 Fall is my favorite, and I imagine God joyfully scribbling vibrant swaths of yellow (aspen), orangey persimmon (aspen and serviceberry), and red (more aspen) in amoeba-shaped swirls on our mountain sides. If my view is this good, His must be spectacular! Yesterday morning, I looked south and found—”snizzle!” The season’s first drizzly scree dusted the range with a snowy cap in craggy crevices, and I reminded myself how rapidly this will change to solid white peaks resembling stiffly whipped cream. I’ll leave this vibrant valley to attend a weekend conference, a pivotal step in my awesome eighteen-month endeavor. God has opened countless doors (and a few windows). People have been so kind—and interested! I’m turning a professional corner much like the seasonal change, generally knowing what lies ahead, well-prepared, with contingencies in place. What an adventure! When I return, piles of leaves will litter the ground. The garden will have to be clipped. Nights will be below freezing for the long haul. The two doe and three fawn in the back this morning will be a little fatter, thanks to our wildflowers and grasses. I’ll coerce Mr. Wonderful into putting the big, crazy metal pumpkins in the front yard, and in return, I’ll fetch the slow cooker for stews. I see His hand in all of these wonderful, invigorating changes, and hope you do, too. Life’s surprises are opportunities to practice a teachable spirit. Welcome to The Cuneiform, an extension of myself and my protagonist, Archaeologist Dr. Grace Madison. The blog is not a self-obsessed venture born of boredom and bravado, but part of a larger platform based on faith and fiction. Grace and I have neither soul patch nor tattoo, adornments we associate with successful bloggers. We are only “hip and trendy” as the phrase relates to curvaceous body parts, and clothes from the seventies, respectively. 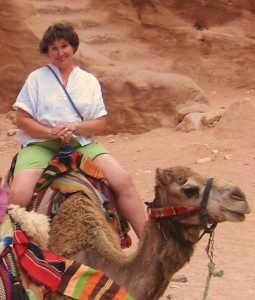 If you can relate, please join us as we ride camels across publishing’s desert. Explore the evolution of love when child-rearing ends, and rediscovery begins. And enjoy the amazing adventure of Christian life shared in weekly blogs. We hope we’ll be good company on your vicarious vacation through Israel and Jordan, Western Europe, Peru and Chile, and Greece and Turkey (so far). God leads us on quite the journey, and we’re finally ready to share. So prop up your dusty hiking boots, shake the desert sand from your safari vest, and brew a cup of hot tea — mint, of course! — to prepare for the stories ahead.